After two seasons of Associations I decided to gave up, to leave the Association I created and say goodbye, maybe permanent. Last season of Associations was decent, I won most of the games because it supposed to be like that, I usually had the better team or very closer with my opponents but this season it was horrible and really made me to give up on the new feature, Associations. There’s no point of playing when the game don’t let you to win. I am really happy with all these new changes recently but this is something that I want to write recently but I didn’t had time and wasn’t really in mood to write about but thanks to the new things that happened to me I am really motivated by the game to do it now. I don’t want to go to much in details about others because for that I will use another article where I can talk more so I will try to stay to my story. Losing vs weaker opponents is my issue at the moment and I’m really not that guy who lose a game and start to cry, no, but I am really at that point when the game is the one that don’t let me to win the game, I just can’t win almost any association game and the funny thing is in the rest of the competitions I do very well with stronger opponents. My question for Top Eleven would be, why should I play in Associations if the system doesn’t allow me to win. I doubt I am that stupid to lose by mistake because I’ve tried more formations, tactics, etc with a clearly big quality advantage and I think I have enough experience in over 5 years of Top Eleven to know how the results goes and how much tactics and formations count. About my opponents I don’t know if they started all their games with full moral and condition but I can confirm that I started with 95-100% and superb moral always or almost, basically I only lost dozens and dozens of green and blue packs for nothing. Worst, to piss me off even more the manager assistant is sending me after the game to increase the “WIN BONUS” because this is one of the reason I’ve lost according to him but guess what? I already have it to maximum. Because Associations is an extra tournament with no real trophies for the managers and only for the Association and because those rewards doesn’t mean much to me, not in my case, I would retire from this competition permanent or at least until Top Eleven will announce that they improved the results because going at the game and losing when you know you have the better team is not fun at all. If is once in a while I would agree with, would keep us engaged but when is so often I think is just STUPID and I really don’t see why I should continue. The funniest part I managed to score 6 goals in a game against this opponent in the Associations and smash him so where’s the logic here? I’m grateful to my teammates for all the effort in the Association and I really hope they will continue to do a great job. Pls I have a friend, and we’ve been on the same league since level 1, he’s been topping the league, he’s my nemesis, I’m so tired of losing 1st positions to him all season. We just finished level 3, and I really wish I don’t meet him in the same league again. So what am I gonna do about this situation? Are we on the same server? We ain’t even from the same country. Pls help needed here! You can dodge this very easy. Just remove him as friend in the last day of the season and add him back after the league is already formed. I pretty much had this issue too, despite I had the better team, I didn’t wanted to compete with a good friend as long I knew he also wanted to win trophies at least as much as me so we used that tactic. The deed has been done already! I got this information late. The league has started and I’ve got back my friend whom I don’t want in the same league, and much tougher friends I met from CL. TO make it worst for me and my league mates, there are level 5 teams in our league, while we are in level 4. Admin this is so sad, bad and frustrating. I’m having a rethink about this Top Eleven. Maybe I should quit. How can I create an association in top eleven? That’s very weird that you haven’t received any money, have you tried to contact the support team? They should be able to tell you if you did or not. That’s awkward. Rewarding tokens is another story that’s I’m personal against, because in this way, teams like mine who win the league 90% (100% in my case 😀 ) will get just boosted season after season. Personally I like upsets. I keep on playing it. Maybe because my assocation won 5 times and 2 times we were 3th. I really like to play in a team, thats why I am looking for 1 or 2 new members, because they are not active. I had good stats with the Association, so far I think we only lost 2 or 3 duels so winning trophies wasn’t an issue, was the fact that I almost ended with better team but bad results. I dont know if I am understanding u correct. I understand this: you were losing to teams that were weaker as you? In real life that happens all the time, I dont see the problem. And its only a game. If I lose I am frustrated too, but it is out of my system in 3 minuten. Is true but one thing is that I don’t like to use and so far last season I just wasted my tokens & boosters to improve and recover my players condition and moral and for what? Trolling? Is just up to anyone but when you get trolled like 9 times out of 12 I just think is to much and I think I can use my resources in better ways. It was the same thing for my association yesterday.. we lost in final.. we dominated every match at home and almost everybody lost.. it was crazy! The booster stuff is just something else and I think is OK with 1 per day otherwise people will add unlimited friends for gifts and they won’t need extra tokens, imagine that you can make hundred of packs like this everyday. Who do you think will buy tokens after? So they need to put a limit.. 100 green pack per day is ridiculous like said but 1 green pack when ten friends send it, it’s ridiculous too..
What’s the point to have friend if you can’t help them? I’m ok to say that 100 green pack is ridiculous, i think they need to put a limit..
On the other side, commercials are a best way to get green pack free. I and the other has ever such as it and it makes disappointed. Just to understand, you told us it is due to bad results ! But it seems due to MVP ratings your players had, you got some wins. Now what I can tell is that versus such your formation, amazing is the rating your players have had. With correct counter formations and orders, and live management, your opponent can easily made you some surprises. I can ensure I did kill some high opponents with same different opposition quality team in all classical compétitions. So why not possible in associations ? You d like to stop. Your choice everyone can understand. But to me, 7 weeks is unsufficient to take such a decision. Especially for you my friend ! I am surprised. Just let you know we got same troubles or almost and we are trying to solve issues. Not easy. Just pleasure. Yesterday I got back to my old Association but just to play some friendly games with my mates and guess what, I managed to beat them both and yea, they had much-much better team then the opponents I showed there so no logic in it. It was just no matter how many shoots I had, no matter how many opportunities I had, no matter how much possession I had, the ball just didn’t wanted to get there and on another side even when I used 3 or 4 defenders, plus a defensive defender I conceded goal in any game. So yea, I prefer to gave up then stress myself with this. Such a shame as a manager as you is certainly really important for the game, for Nordeus… and maybe only reports can solve some amazing situations. You re right ! Sometimes is possible, allways not ! Yes you re right, it is not stressless. I wasted lot of time with my association trying to improve what was wrong for us. It s hard. And we really would like to solve it. Future will decide. i left my association as well im nearly always competing in 3 competitions .and must spend rest and moral packs to get my players in good form too face silly losses against much weaker teams to get rewarded with 3 packs in return . what’s the point of associations if the inpunt is much heavier than the return ???????? The meaning of the association is to have fun because you don’t win very much from it so yea but the worst is that you get trolled and also you are wasting boosters / tokens to prepare your team for the games. i feel your pains because its my pain too. my conclusion is that Top Eleven is just a business outfit which knows how much we love football and so have used this game to collect our money to enrich themselves. i love the game and i love my association memebers because they are great fun guys but the issue of HIGHLY EXPENSIVE TOKENS is CRAAAAAAAAAAAAAAAAAAAAAAAAZYYYYYYYYYYYYYYYYYYYYY! it makes me feel like a fool at times and i wana quit the game but i guess i am addicted already but top Eleven has to do something to also make the customers happy. without us you guys are not in business and i thought it is said that Customers are always Right or is that a lie? How do you change teams in association??? Can you please help me add some 3 5 star teams to my newly created association? I just created it some days ago. Glitched accounts. Until recently the association games were fun and well balanced. My association enjoyed many wins and I personally meet good like minded individuals. Last week we got picked against a team who had not lost one single tournament. For some unknown reason I took a screen shot as I believe this is a glitched account (Software enbedded in their phones so they cannot loose) Nordeus say it is impossible to cheat. Being drawn against them this week I noticed the team had 6 new members with the other members account details (Not a good sign at all). I checked the top 50 in the world and they all seem to come from Middle East/ China and have perfect records. Has any other members experienced the same thing. Can Nordeus convince us all these are not glitched accounts or worst accounts built by Nordeus. I can assure you that there is no hack for such thing. Yes there are exploits in the game but none regarding results. The reason they have perfect records is because they trick the system to play with lower quality opponents and that’s it, not because they have some kind of a tool to make them not to lose the games, etc. How on earth is it possible to “trick” the system? Unless this is by managers playing multiple accounts using level 1,2 and 3 teams as well as their own highly rated first team. You can see it happening. Have been watching Romania since Sunday. Constant ins and outs but 2 highly stared managers remain. There are others in the top 100 too. It’s making me and my association members wonder why we bother. I can assure you that there are ways to cheat the system but no real hacks regarding Top Eleven. There might be some tools to get tokens or boosters for example but they don’t work directly on Top Eleven but on the “3rd part” a.k.a offer providers. Now we can’t share the tricks because we don’t look to promote these things but no point to hide that there are none so just google a bit and you might find. Top eleven recently has so much crazy things! I lost and drow against 10 teams that 20 to 30 percent weaker than me, but I can not win against 1 team even 1 percent stronger than me!!! Yes, in football everything happens, but this is so strange!! My team point is 101% and I have offensive players with 135% and 105% and I checked my opponent teams defensive is around 70 % with 35 speed!!!! 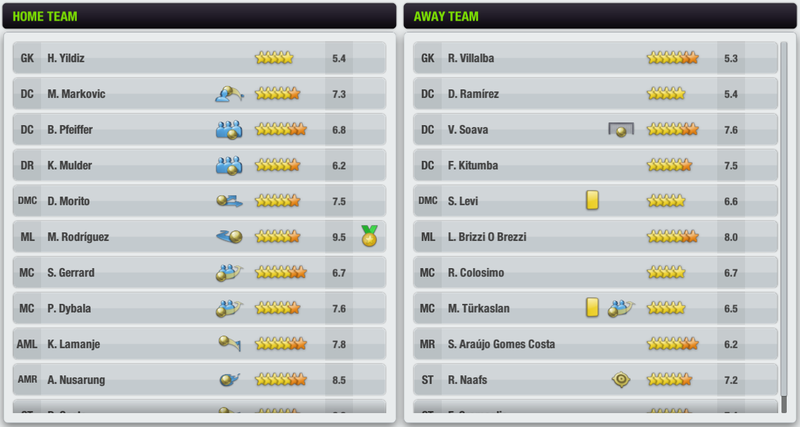 But after draw, top eleven said that ” we couldn’t get the ball of their defenders!!!!! Ok maybe it happen, but my question is, why when I lose again the team only 2 percent stronger than me, it said they are so stronger than us!!! !